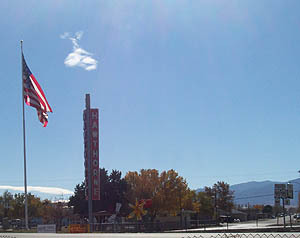 They call it "America's Patriotic Home," and the red, white and blue streets and American flags blowing in the breeze stand as testament to Hawthorne's great national pride. Once part of Western Utah Territory, gold was discovered at Aurora in 1860 and in 1861, miners of all types began to arrive in the area looking to strike it rich. While most people think of 1861 as the start of Hawthorne's history, named in honor of Judge W. A. Hawthorne, a pioneer of Nevada and Esmeralda County, it is far from the beginning. What is now called Walker Lake, just out side of Hawthorne, had long been the home of the "Agai Ducutta Numa" members of the Paiute tribe who's name means Trout Eater People. Another earlier influence were Spanish Miners who traveled this way from Mexico in the early 1800's. At the Mineral County Museum you can see a collection of Mission Bells that were found buried in the ground about 15 miles southeast of Hawthorne, Nevada. Features mining equipment, historic vehicles, Victorian clothing and furniture, a 1907 drugstore, plus animal and fossil exhibits. The El Capitan in Hawthorne is THE hot spot between Reno and Las Vegas! Pink and blue neon atop the circle bar are reminiscent of an old style Vegas gamblin’ joint. Don't be deceived because the nostalgia stops there!